In 1918, His Highness Sheikh Zayed bin Sultan Al Nahyan , may God bless his Soul, was born into the Al Nahyan family, who had ruled the emirate of Abu Dhabi for hundreds of years. He was the youngest of the four sons of Sheikh Sultan bin Zayed, who ruled Abu Dhabi from 1922 – 1926. When Sheikh Sultan’s successor died in 1928, Sheikh Zayed’s eldest brother, Sheikh Shakhbut, was elected by the family to be ruler. At that time, Abu Dhabi was a part of the Trucial States. When Sheikh Zayed was a child, education was scarce. He received instruction in the principles of Islam and memorized much of the Holy Qur’an, however, and always demonstrated a voracious appetite for knowledge. This led him to accompany the Bedouin tribesmen into the desert. In 1946, Sheikh Zayed was elected as ruler of Al Ain. Immediately at that time, Al Ain began to be developed and to integrate into a township and Agricultural production began to flourish, as did the local economy. On August 6th, 1966, Sheikh Zayed became Ruler of Abu Dhabi, and within weeks a massive development program was underway. Schools, hospitals, roads and housing were constructed. Zayed’s vision had always extended beyond the borders of Abu Dhabi. In 1968, Britain announced that it would withdraw from the area before the end of 1971. Immediately Sheikh Zayed took the lead in calling for a federation of the emirates. The rulers of the emirates moved quickly and on the 2nd December, 1971, the United Arab Emirates formally emerged onto the international stage While Sheikh Zayed himself always attempts to share credit for the remarkable ensuing developments with his fellow members of the Supreme Council of Rulers (comprising the ruler of each of the seven emirates) no-one doubts that, without his wisdom and guidance, they would never have happened. 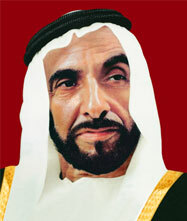 The Supreme Council itself has recognized this by re-electing Sheikh Zayed to successive five-year terms as President. Since its establishment, the UAE has confounded international expectations by developing successfully in all areas of life; social services, health and education, communications and technology, trade and finance, at a rate almost unmatched anywhere or at any time. More importantly, these material achievements have occurred against a backdrop of political and social stability. Throughout history, few leaders can have experienced the amount of radical changes that Sheikh Zayed has witnessed. Fewer still could reflect on them in the knowledge that they chose and acted in accordance with their beliefs and for the betterment of humanity, regardless of personal cost, financial or otherwise. Sheikh Zayed has the love and admiration of his people and international recognition and respect, all of which he has earned many times over. On the 2nd of November 2004 Sheikh Zayed, the nation leader had passed away, after a long journey of giving, achievements and development of people and land. In line of the his vision, the nation keeps going under the leadership of His Highness Sheikh Khalifa bin Zayed Al Nahyan, the president of united Arab Emirates and the members of the Supreme Council of Rulers and their crown princess.